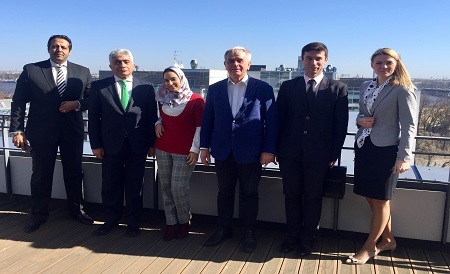 On April 3, 2019 RTU Deputy Rector Prof. Igors Tipāns and the Project Manager of International Cooperation and Foreign student Department Laura Štāle welcomed representatives of the Ministry of Investments and International Cooperation of Egypt at RTU Ķīpsala Campus. Prof. Igors Tipāns gave presentation of study programmes offered to international students, presented the development of RTU and gave insight of facilities available for Egyptian students during their stay in RTU Campus. Currently there are 23 students at RTU from Egypt. The increasing number of students from North African countries was also discussed, as well as opportunities for further cooperation, both in cooperation with the Embassy of the Republic of Latvia in Cairo and with Egyptian universities. RTU has good cooperation with Nile University. During the conversation, there was a discussion on the official recognition by Egyptian authorities of the degrees obtained in Latvian higher education institutions. RTU in cooperation with the Higher Education Export Association is planning a visit to Egypt in spring 2020 to promote higher education in Latvia, as well as to attend secondary schools whose graduates are interested in continuing their studies at Latvian universities. Egyptian officials expressed the belief that the study programmes offered by RTU, the living conditions, and Latvia as a safe and green country are very attractive to potential students from Egypt.